Adding iron salt or iron hydroxide to sludgemixed liquor in an aeration tank of a conventional activated sludge processes (bioferric process) can simultaneously improve the sludge’s filterability and enhance the system’s treatment capacity. 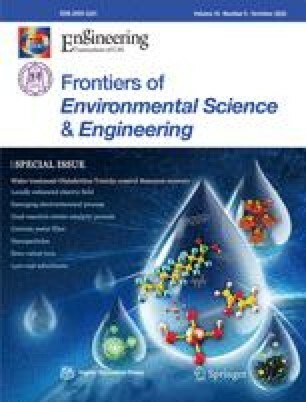 In view of this, Fe(OH)3 was added to a submerged membrane bioreactor (SMBR) to enhance the removal efficiency and to mitigate membrane fouling. Bioferric process and SMBR were combined to create a novel process called Bioferric-SMBR. A side-by-side comparison study of Bioferric-SMBR and common SMBR dealing with dyeing wastewater was carried out. Bioferric-SMBR showed potential superiority, which could enhance removal efficiency, reduce membrane fouling and improve sludge characteristic. When volumetric loading rate was 25% higher than that of common SMBR, the removal efficiencies of Bioferric-SMBR on COD, dye, and NH4 +-N were 1.0%, 9.5%, and 5.2% higher than that of common SMBR, respectively. The trans-membrane pressure of Bioferric-SMBR was only 36% of that in common SMBR while its membrane flux was 25% higher than that of common SMBR. The stable running period in Bioferric-SMBR was 2.5 times of that in common SMBR when there was no surplus sludge discharged. The mixed liquor suspended solids concentration of Bioferric-SMBR was higher than that of common SMBR with more diversified kinds of microorganisms such as protozoans and metazoans. The mean particle diameter and specific oxygen uptake rate of Bioferric-SMBR were 3.10 and 1.23 times the common SMBR, respectively.